PRODUCT DESCRIPTION: Houseplant insect killer combines the effectiveness of pyrethrins and potassium salts of fatty acids to kill on contact but does not harm your plants! The pyrethrins attack the insect’s nervous system and potassium salts weaken the insect’s protective outer shell, adding up to a lethal insect killing combination! This product is OMRI Listed® and compliant for use in organic gardening pest control. 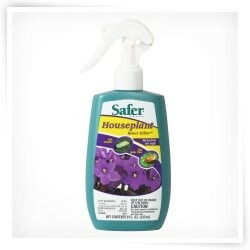 WHERE TO USE IT: Use on Houseplants: To kill aphids, spider mites, red mites, mealybugs, thrips, scales, caterpillars, and whiteflies. Apply when insects or their damage first appear. Spray to thoroughly moisten all plant surfaces where insects are feeding or resting. Repeat treatment every 7 to 10 days when insects are present as needed to prevent damage.